Lassen Peak was originally a side-vent of a much larger volcano, posthumously named Mount Tehama, that exploded with huge force many thousands of years ago leaving a ring of hills some 3 miles across. 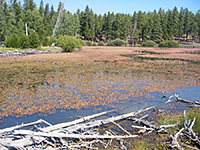 Lassen itself has erupted several times, most recently after a violent explosion in 1915. 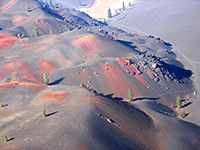 Contemporary volcanic activity continued until 1922, by which time the mountain and surrounding area had become part of the Lassen Volcanic National Park. 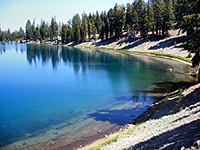 Lassen is the world's largest volcano of the plug dome type, and is visible for many miles across north California, rising 1,000 feet higher than any other nearby summit. 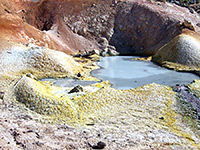 In the 60 years since the last disturbance, the land close to the volcano has largely recovered but much evidence of the destruction remains, and the national park has many fascinating geothermal features including mud pools, hot springs and gas vents. 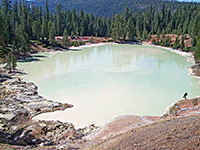 These occur mainly in the area once occupied by Mount Tehama, but are also found at locations of other ancient volcanic eruptions; major locations are Boiling Springs Lake, Bumpass Hell, Devils Kitchen and the Sulphur Works. They form part of an impressive mountainous landscape, partly forested, also containing steep glaciated valleys, cliffs, lakes and waterfalls, together with several other volcanic domes and ancient lava fields. The national park is 200 miles from San Francisco, in a sparsely-populated, hilly area north of the Sierra Nevada mountains, officially part of the Cascade Range that extends north all the way to British Columbia. Two major east-west roads, CA 44 and CA 36, pass either side of the park and intersect with CA 89 which winds through the western section, passing close to most of the major features. This is the only paved access route although several gravel tracks lead to sites in the more remote eastern section, including Butte Lake and Warner Valley. 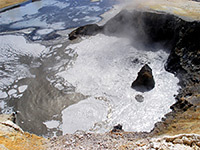 Most visitors approach from the south and drive only a few miles from the entrance to view the nearby thermal areas, but it is well worth continuing the whole way across the park to get a better appreciation of the varied landscape. This scenic drive takes about 90 minutes excluding stops. 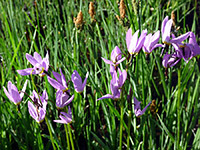 The park also has a fine network of hiking trails. 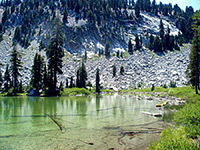 Lassen is one of the most unusual places in California, yet is relatively little visited, partly because it is a long way from most other famous natural attractions in the state. Also, access is restricted due to the heavy snowfall that this area receives - the park may be fully open for only 3 months of the year though is at least partially accessible in any month. 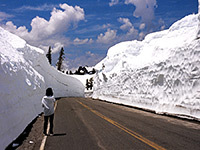 It is amazing to visit when the road is being ploughed after a hard winter as although the machines leave the surface clear, the vertical walls of snow at either side may tower many feet above, enclosing the road in a dazzling white canyon. The closest hotel to Lassen Volcanic National Park is the recently opened Best Western Rose Quartz Inn, which provides 50 comfortable rooms in the center of Chester at 306 Main St (CA 36) - a mile from the north shore of Lake Almanor and 29 miles from the southern park entrance. The tree-lined neighborhood has a mixture of residences and businesses, including plenty of restaurants an easy walk away. The hotel has an exercise facility (though no pool), and serves free continental breakfast. Other nearby towns with hotels are (with distances from the south entrance): Red Bluff (50 miles), Susanville (64 miles) and Chico (70 miles), while Redding is 47 miles from the northern entrance.